Rua116 is located is a four-story building. 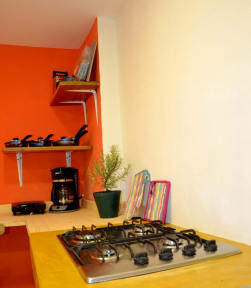 It offers a TV, a reading lounge, a kitchen, a small internet café and Wifi. It also has a terrace on the top floor, where special events can take place a day of the week, allowing the guest to enjoy a drink and chill out. Films and alike can be projected there as well. The property is located in an alley, which can be reached from the Carrera 6a, being the alley the second if coming from the South (or the nearby shopping mall), or the first alley if coming from the North (if coming from the nearby main square). The alley is located between restaurants a building under construction, being the gate a black iron one. There, a sign of our Hostel will be placed. The Hostel is the second door from East to West. 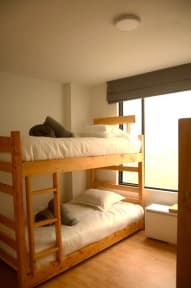 We offer dorm rooms and privates rooms with private bathrooms. Some privates rooms have cable TV.